This suite is located just steps from the ocean and features full kitchen, living room with electric fireplace, bedroom with queen bed and master bedroom balcony, on-suite bathroom and in-room Jacuzzi tub. 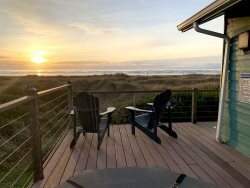 You can not get a room closer to the beach in Ocean Shores, you can lay in your bed with the door open and hear the waves crashing and take all your worries away! We were very happy and will likely stay here again. Absolutely no complaints. We stayed at the Caroline Inn. This property more than lived up to our expectations. Clean, quiet, close to the beach. Everything we hoped for and more! We will definitely be back! What a beautiful place we stayed in and the view was incredible. Our first stay on the Pacific and we couldn't have been more pleased. Tammy was friendly and helpful at check in. At check out she remembered this was our first stay at the Inn and asked us if we enjoyed our stay and if our room had everything we needed. She seems to really care about the guests vacation experience. Beautiful view, comfortable,clean and well kept room, easy beach access - the Caroline Inn is a great choice for two adults looking for a relaxing vacation. We will definitely come back! Everyone was great, from my initial call to confirm my dates to checking in, checking out, just outstanding. Very helpful. Tammy was super sweet and helpful after our reservation was messed up by another company she was able to get us in unit we wanted after all! She was understanding and patient!